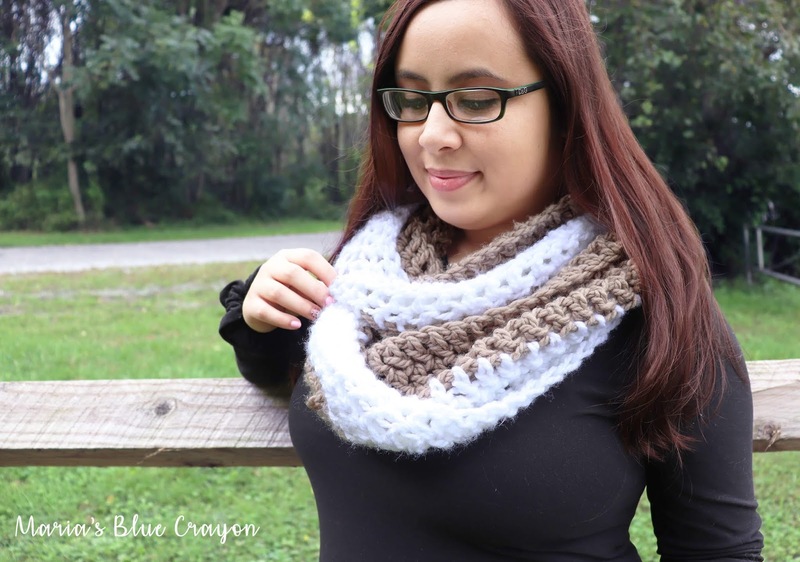 I’m excited to share my first free crochet pattern with you! 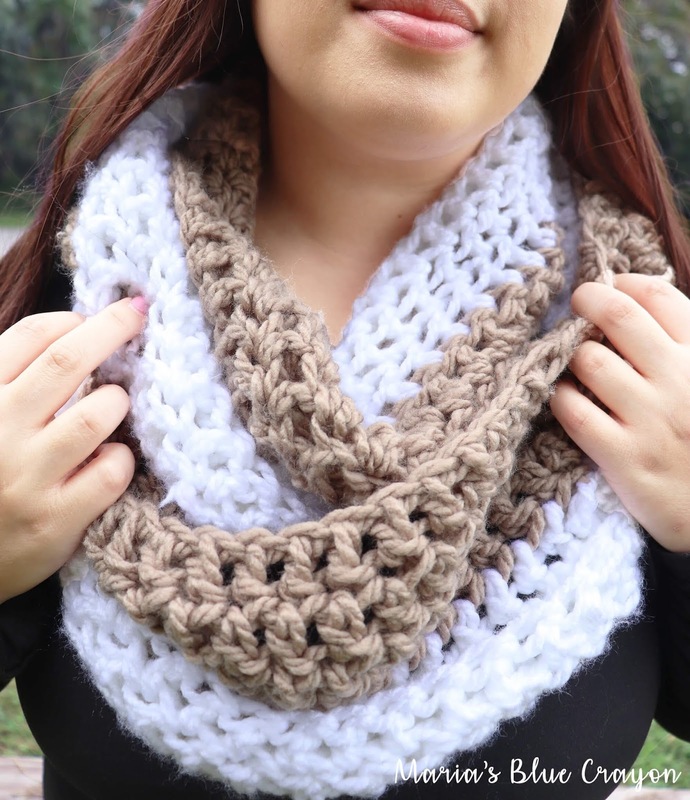 This infinity scarf is very versatile, soft, and cozy. It’s one of my favorite things to make and give out as gifts. The color options are endless, and can fit into anyone’s style. I personally choose to use the Loops and Threads Charisma yarn that you can find in your Michael’s craft store. I have also used Lion Brand Hometown USA Yarn and Lion Brand Wool Ease Thick and Quick, which works nicely if you want a super chunky scarf, but you may need an additional skein as it’s not a vary large skein. Amazon is a great place to buy this yarn – I can usually find it cheaper on there than the craft stores. Click here to get it. You can use any type of bulky yarn you can find. 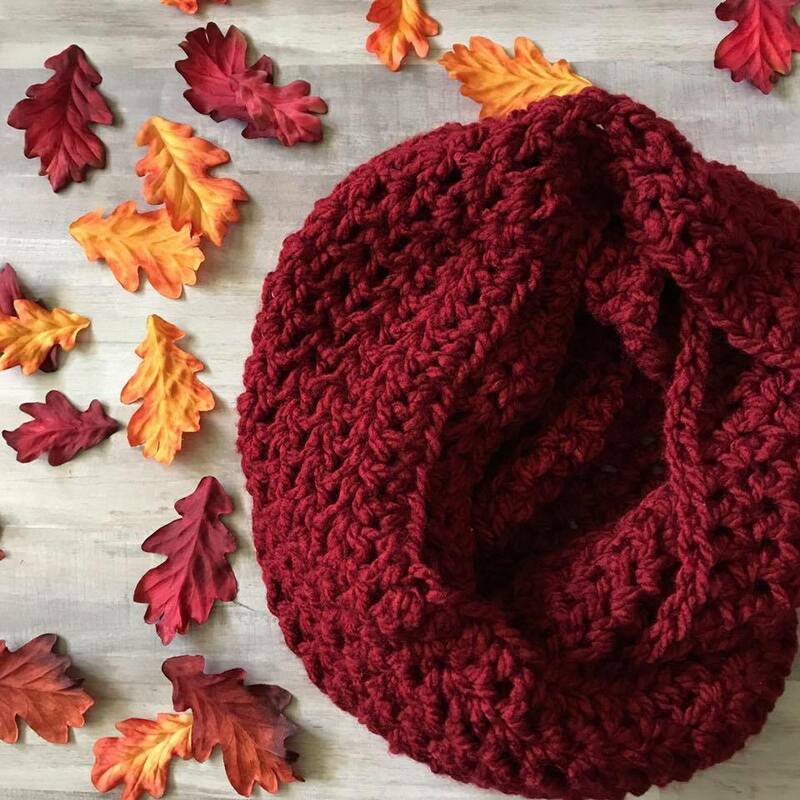 How do you know what is considered “bulky yarn”? You will find it on the label, like shown below. It will say “bulky” and also represented with a number 5. You can also make your scarf two colors like I did by making half of the rows on color and half rows another color. I loved pairing these whiting and taupe neutrals! Below you will find what materials you will need, how long it may take, and also what stitches you will need to know in order to finish this project. 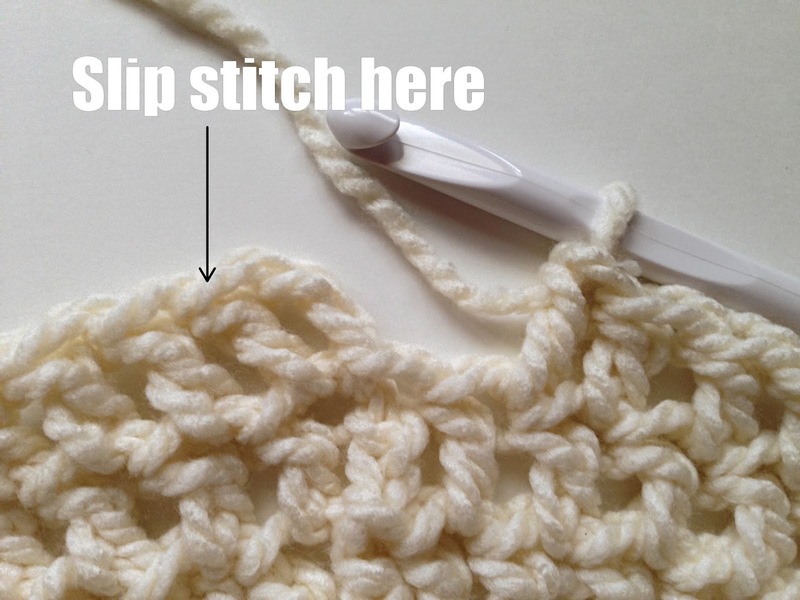 If you’re a newbie – I advise watching YouTube videos to learn the stitches, there are tons out there! Give yourself 1-2 hours to complete this project. If you’re an experienced crocheter, it may take you much less time. Row 1: Chain 90, slip stitch into very first chain making sure there are no twists in the long chain. Tips: I’ve provided pictures on the trickier parts if you’re a beginner! double crochet into the first chain space. 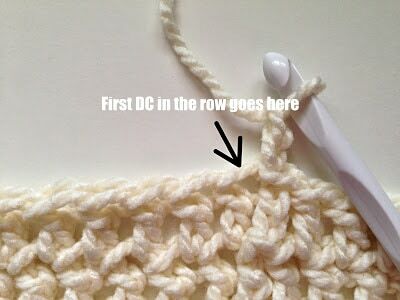 Slip stitch into the first DC, not the chain 2. Please share and PIN this pattern to your Crochet boards on Pinterest! Previous Post: « Welcome to my blog! Hi! Do you know the mm of the hook you used? Thank you so much!!!! Do you have a full pic wearing it?